Gutter King was established in 1976 and has serviced thousands of residential and commercial Puget Sound clients over the past 40 years. Our work has been featured on The Street of Dreams as well as in AIA Homes of the Month. Our many years of superior work and professional service has us recognized as the premier gutter service company. 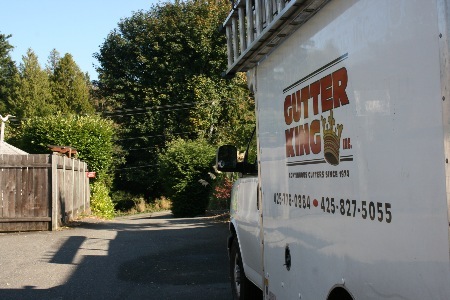 We provide gutter services in Mountlake Terrace and Lynnwood. Very few companies have been in this business as long as us, we get it. We understand home repairs can be unpredictable and stressful. That's why we have dedicated ourselves to superior customer service and superior workmanship. We fully guarantee our superior workmanship for 5-years on installations and 40 years on our aluminum gutters. Year-round gutter installation, repairs, and cleaning services. Gutter run-out and delivery for those who want to install themselves. Retail sales of gutter accessories.